In this verse in John, we tend to ignore the five little words, “as the Scripture has said”. Maybe there is a key in those words, a reason why we are not bubbling over with springs and rivers of living water. Maybe, just maybe, we tend to worship a Jesus made in our own image, not the Jesus of the Scripture. In the past few months I have re-read all the writings of John and recorded all the titles of Jesus in the gospel of John, in 1,2, and 3 John, and Revelation. In just the first chapter of Revelation alone, we have so much revelation of Who Jesus is! When we have true revelation of Who Jesus really is, then doesn’t relying on Him, trusting in Him, cleaving to Him, happen more readily? and flowing with springs and rivers of living water. Beautiful words to my heart today! Have a wonderful, blessed Easter, my friend. Because He lives, I live! Have a most blessed Easter! Great words! May we all come understand who Jesus truly is and what He did for us! "He Who Ever Loves Us"....I adore that one, Elizabeth. It comforts me and calms my soul. Thank you for this wonderful reminder today, my friend. It was truly beautiful! Have a most blessed Easter! What a wonderful message! Thank you for sharing. I was so happy to find your blog this week. I have enjoyed all the posts I've read so far so decided to link you up on my Sunday Social this week. Keep spreading the Word, your blog is a blessing to those who read it. Beautiful photo, I always love water photos. He is awesome and amazing. Beautiful verse and picture. Have a blessed EASTER my friend. Elizabeth, I think you got it right with the statement: "Maybe, just maybe, we tend to worship a Jesus made in our own image, not the Jesus of the Scripture." Nice to meet you! Absolutely lovely photo and scripture to match. Your words really spoke to me. Thank you for the reminder of who Jesus is. Great post, Elizabeth. I think I'll forward this to my pastor. Hope you've enjoyed a blessed Easter. 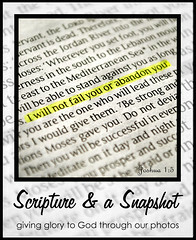 Love that photo and the verse! My verse is similar.